My 30 years of work as a therapist before becoming a pastor is still used to inform much of my theology, including that which relates to Christ’s crucifixion and resurrection. For example, I often found that people who were afflicted with higher than normal levels of depression or anxiety were often stuck in some kind of a grief reaction they had not been able to break free of on their own. Grief, as we know, follows any death. It follows any loss but never more so than our loss of expectations. Such losses are highly traumatic and stressful. And they take us on a journey into such emotions as anger and guilt. Notice I say into. Whether we make it through these emotions or not depends on how we manage our grief. And whether or not we can accept our own anger and our own guilt. When we cannot accept these emotions, we do not accept the loss itself at the deepest level needed to move forward. We become stuck. We enter our own tomb, as it were. Anecdotally, I would often find persons stuck after a major loss in life with emotions of anger that never seemed to find an end point. More often than not, these were individuals who could not accept their guilt and so needed anger to continue as a defense. Blaming another is often a defense against having to accept our own painful guilt. Ongoing anger seems to these persons less painful, and more acceptable, than facing one’s own guilt. I’ve found that others get just as stuck with emotions of guilt that also never seem to end. More often these were individuals who could not accept their anger and so need guilt to continue as a defense against having to accept painful anger. Ongoing guilt seems to these persons more acceptable than to face one’s own anger. Grief is like a tomb we have to spend some time in after a death or loss. Resurrection is a break-through that happens providing we don’t get stuck forever inside the tomb of our own anger or guilt. The orthodox Christian theology of Christ’s crucifixion contends that we are forgiven because God has forgiven us, and that other sinners are also forgiven as well. The cross is all about God’s forgiving them or us. Christ died for them. Christ died for us. Right? Pardon my unorthodoxy, but I’m not so sure that is right. As mentioned in prior posts, Jesus made it a point when saying that he would be crucified and buried but then resurrected that we who would follow him must take up our own cross. Lose our own lives for his sake. Try reading Mark 8:31-37. Notice that Jesus says nothing about dying for us but everything about dying with us on the cross. I find it cringe-worthy to hear Christian believers emphasize what Christ has done for our enemies, or for ourselves, that we can’t bear doing for them or for ourselves. Why do I cringe? Because that is so foreign to the Gospel Jesus himself proclaimed in which we, too, must participate in loving and forgiving our enemy. Or loving and forgiving ourselves. Jesus ain’t going to do it for us. He’s only going to do it with us. Or else we get stuck inside our own tomb of anger and guilt. 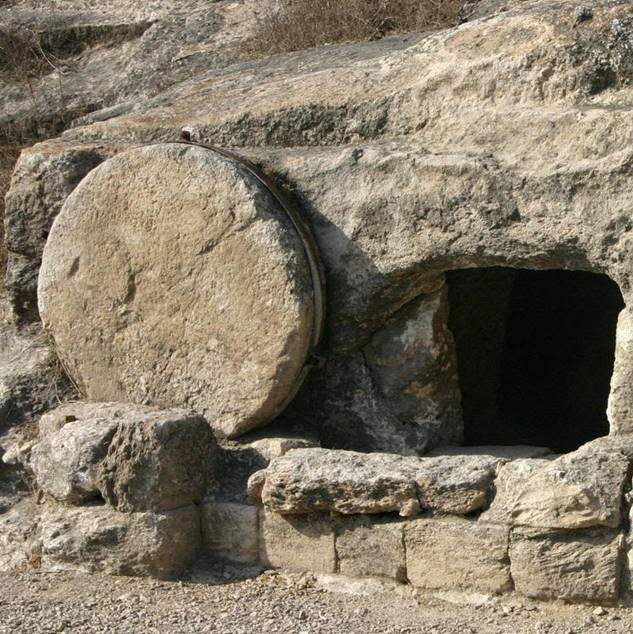 And our own stone doesn’t get rolled away and we don’t find Easter’s resurrection joy in our own lives quite like it happened for Jesus himself on that new morning of the 3rd day. The British hymnist, Thomas Shepherd, left the Anglican Priesthood to pastor Nottingham’s independent, non-comformist Castle Hill Meeting House back in the year 1694. He took with him this hymn he had penned one year earlier. Its words suggest to me that it’s not enough to believe Jesus took care of it all for us. He forgave or forgives so we don’t have to? Nope. It doesn’t work that way. Shepherd’s hymn carries this important message that suggests our path to resurrection travels through not the grief of Christ’s crucifixion but also our own. We will leave the tomb and be resurrected with Christ because we have first been crucified with Christ. And when from our own cross we lose all our own anger and guilt, forgiving our own enemies and ourselves. May it be so today that we may have the happiest Easter tomorrow. Years ago I was taught the story of the cross of crucifixion on which Jesus died on this so-called Good Friday nearly 2000ish years ago. The story came with a picture. It featured two giant walls separating God in heaven and humanity here on earth. Between these walls was a deep pit into which humanity would fall upon our earthly death into this chamber of horrors we call hell. Flames were bursting up and people therein were crying out in anguish as part of their eternal conscious torture for having sinned while on earth. Meanwhile, God placed a giant cross that was pictured as a bridge above this pit of hell that would connect heaven and earth and allow us to cross safely to this “other side” upon our earthly death. Now as I recall this picture and the word-story that came with it, there was an implicit toll collected at the earthly side of this bridge. It amounted to a set of passwords broken down into three essential phases of what some Christians called “the sinner’s prayer.” In approximate sequence the prayer went as follows: “God, I am sorry for my sins. Thank you for sending Jesus to die on the cross for my sins. Please save me by his blood shed for me on that cross.” I was inclined at the time to think I could even get the sequence wrong and still find my password accepted enough to open the toll gate and let me across into heaven as opposed to being dropped into the raging inferno of hell as punishment for my earthly sins. To say that I bought this story is something of an understatement. I actually taught this story to others. This story is nowhere to be found in the Bible. No. Not even in the so-called Romans Road as presented by Paul. It is imagined to be in the Bible by those who first were told the story and then were led to find the exact verses in Romans, Hebrews, or elsewhere that would support their image, a kind of public discourse to support their privately assumed narrative. Using a different set of imaginings, we can take Paul at his word in Romans 10:13 when he says we are saved by calling upon the name of the Lord. Period. Password already remembered by default. So why the cross then? Obviously, it depends on who you ask, even in scripture. Among the original disciples present to hear Jesus tell about himself and his own purpose here on earth, none apparently understood him to ever say he was to die on the cross for our sins so we can go to heaven when we die. Luke goes to great lengths to write about Jesus and his disciples going to Jerusalem, noting as early as 9:22 that there he would be killed and would rise again on the 3rd day. Trouble is that in that same setting Jesus spoke of everyone who followed him as having his own cross to also bear, his only point being that to not lose our own lives in that way for him would interfere with our being saved. Which does nothing to square with the later words of I Peter 3:8, or Paul’s words in Romans 4:25. Either the Gospelists skipped over what Jesus said himself about dying for our sins or else Jesus frankly didn’t say it at all or didn’t deem it very important if true at all. Jesus is quoted as saying other things about why he came to earth, but coming to die for our sins so we could go to heaven instead of hell? If Jesus, being God, gets to tell his own story, perhaps we should look then for other possible reasons for his death. Possibilities Jesus may well have left up to us to discuss and resolve. Is it possible, I wonder, that the bridge imagery for the cross can tell a different story? Can the separation between ourselves and God that we often call sin be compared to the disconnect between our bodies and our souls? Could it be that our minds play a critical role as intermediary between our known for certain bodies and our fearfully unknown, uncertain souls (sometimes regarded as the Spirit world)? Could the mind in siding with the body answer the physical and emotional stress in this world with the building of a wall of protection seeking its own control on the body’s behalf? And could that wall be the great disconnect, then, between the body that emotes our fear and desire into our minds as a cry for help…………..and the soul that instead empowers with God’s indwelling presence? Could that wall of protection placed between body and soul as the mind’s own survival plan be ironically the very thing that brings death instead? Could it represent even the way in which we lose our lives attempting to control or save them ourselves? Just supposing such possibilities exist, and supposing the mind has the critical role in causing sin and death despite its good intentions of protecting the body’s known desires and fears quite apart from the soul’s unknowns and uncertainties. Then what? Jesus, being for me at least God’s body in relation to God’s own mind and soul (let’s call this trinity the Son, Father, and Holy Spirit), appeals to his own mind as a son appeals to his father when afraid and seeking protection. In his Gethsemane prayer, Jesus emoted as any one of us might have done in the face of crucifixion. In asking for this cup to pass from him, he may as well have been asking his Father / mind to build a wall. Protect me from this unknown on the other side. Disconnect me from the uncertainty of this “other” in that near-term future. Only there’s more to the Son’s prayer to the Father in the garden. Right? There’s the part about “not my will but yours be done.” After which the Father, God’s mind, takes down the wall and crafts it into a bridge. A cross for Christ to use in reconnecting with the Holy Spirit. See also Luke 23:46 — Jesus called out with a loud voice, “Father, into your hands I commit my spirit.” When he had said this, he breathed his last. For me this begs one last set of questions: is the cross really a bridge after all but with a very different story behind it? A cross that allows our own scared bodies to trust our own sacred souls? Trusts the wall to come down and a bridge, a cross, to go up? Trusts the sacred soul to empower even the scared body? Trusts perfect love to cast out all fear? Trusts love to forgive sin? All sins? Trusts atonement to replace brokenness, connection to replace our disconnect prior to that cross? This is another story of the cross. Call it a re-storying about why this day, Good Friday, is different from any other day. It’s also about a bridge. Also about re-storation. Unless your own mind tells you that’s impossible.